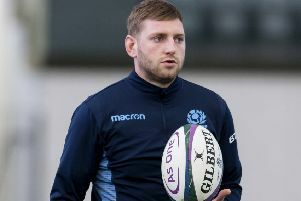 Scotland were cruelly denied a first win of their Six Nations campaign last night when Wales snatched victory with the last kick of the game. A hotly contested game played in bitterly cold conditions saw Shade Munro’s side win the try count 3-2, but after Chloe Rollie, pictured, put the home team ahead seven minutes from time, the visitors fought back to equalise in the final seconds before the conversion in time added on gave them the win. A bonus point for a narrow defeat was scant reward for a performance that from first to last was a significant improvement on previous outings. Scotland wasted no time in taking the game to their opponents, twice producing promising multi-phase attacks. The first was halted by an obdurate defence, but the second saw Jade Konkel open the scoring from short distance after captain Lisa Thomson had taken a quick tap penalty. Lana Skeldon’s conversion attempt was carried wide by the wind. Wales soon reduced the deficit with a Robyn Wilkins penalty from in front of the posts, then took the lead with their first try after quarter of an hour. Scotland conceded a free kick at a lineout inside their own 22, and that set up the visitors for a series of drives that culminated in flanker Bethan Lewis forcing her way over the line for a score to which Wilkins added the two points. Scotland quickly hit back when, with too many Welsh defenders sucked into a maul on the goal line, lock Sarah Bonar glided through some space on the blind side to get her team’s second try, again unconverted. Wales thought they had got back in front in the last minute of the half when No 8 Siwan Lillicrap picked up and dotted down, but the score was denied when a replay showed she had lost it forward. With the weather worsening after the break, clear chances were few until, with seven minutes to go, the best move of the game put Scotland back in front. Nothing looked on at first, but Thomson spotted a space, attacked it, and then passed to Hannah Smith. The centre drew the last defender then put Rollie in for a score on the right. Skeldon was again just off target with the conversion attempt. With three minutes to go Wales got a penalty and went for touch. From the lineout they moved closer to the line, and just as the clock went into the red, Lillicrap drove over, leaving Lleucu George to convert and bring the game to an end in the cruellest of fashions for Scotland.